Each hair on your body grows from a hair follicle, a tiny, saclike hole in your skin. At the bottom of each follicle is a cluster of special cells that reproduce to make new hair cells. The new cells that are produced are added on at the root of the hair, causing the hair to grow longer. 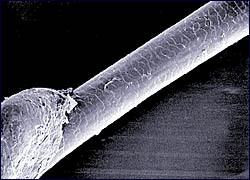 A micrograph of a hair shaft. Note the layered cuticle on the shaft and the bulb at the bottom. --Micrograph courtesy of Paula Sicurello/U.C. Berkeley Electron Microscope Laboratory. The living tissue that makes your hair grow is hidden inside the hair follicle. The shaft, the part of a hair that you see, is made of cells that aren't living anymore. That's important to know when you are messing with coloring or perming or straightening your hair. If you cut yourself, your skin can heal, since it's living tissue. If you damage your hair, it can't heal. You just have to do what little you can to repair the damage or cut the damaged hair off and wait for more hair to grow back. Each hair shaft is made up of two or three layers: the cuticle, the cortex, and sometimes the medulla. The cuticle is the outermost layer. Made of flattened cells that overlap like the tiles on a terra-cotta roof, the cuticle protects the inside of the hair shaft from damage. To feel the cuticle, just pinch a single long hair between your fingers starting up near the root. Pull the hair between your fingers and feel how slick and smooth it is. As you move from root to tip, you're running your fingers in the same direction as the cuticle layers. Now start at the tip of the hair. In this direction, the hair may feel rougher; it may squeak as it passes between your fingers. You're running your fingers against the grain, and you're bumping into the edges of all those flattened cuticle cells. It's handy to know how different conditions affect this protective layer on the outside of each hair. Chemists talk about solutions that are acidic (like vinegar or lemon juice) and ones that are alkaline (like a mixture of water and baking soda). In an acid solution, the cuticle cells shrink and harden. In an alkaline solution, the cuticle cells swell up and soften. Underneath the cuticle is the cortex, which is made up of long proteins that twist like the curly cord on a telephone. Try stretching a hair and you'll find that it's elastic—it stretches before it breaks. When you stretch a hair, you are straightening the coiled proteins in the cortex. When you release the hair, the proteins coil up again. The pigments that give your hair its natural color are tucked among these protein strands and protected from the elements by the translucent layer of cuticle cells. When you get split ends, you're seeing the cortex at its worst. You've worn away the protective cuticle on the tips of your hairs with harsh treatment like hard brushing or too much sun and water. Without the cuticle, the fibers of the cortex fray like the strands of a rope. Since the cortex can't heal itself, the only way to get rid of split ends is to cut them off. In the center of some hairs is the medulla, a soft, spongy mass of tissue. Coarse hair generally has this layer, while fine hair usually doesn't. The presence or absence of a medulla doesn't have much to do with how your hair behaves when you wash or color or curl it, however, so you don't have to worry about it. To fill the gaps between the protective cuticle cells and to keep your hair shiny and flexible, glands adjacent to the hair follicle produce a kind of natural hair conditioner called sebum. Unfortunately, that sebum, which is an oil, also makes dirt stick to your hair. When you shampoo your hair, you wash away this protective oil and the dirt that clings to it.